The world’s most powerful rocket launched this weekend carrying... well, we’re still not quite sure what it was carrying (although speculation suggests a super secret spy satellite). What we do know is this: it launched, and it looked incredible. ULA Launch’s Delta IV Heavy is currently the most powerful and largest rocket in operation. Even it, however, is no match for the power of gathering storm-clouds, which forced the rocket into a several-hours-long holding period during its initial launch attempt last Thursday. Saturday afternoon, the US National Reconnaissance Office took a second, more successful stab at launching their secretive cargo. For now, this photo series shows the most powerful rocket launch you can see—and it is, indeed, an impressive sight to behold. But as our plans for space get bigger and further so do our rocket designs to allow for the possibility of trips further out, even to Mars. Newer designs are already on their way to dethrone Delta IV, like SpaceX’s Falcon Heavy. 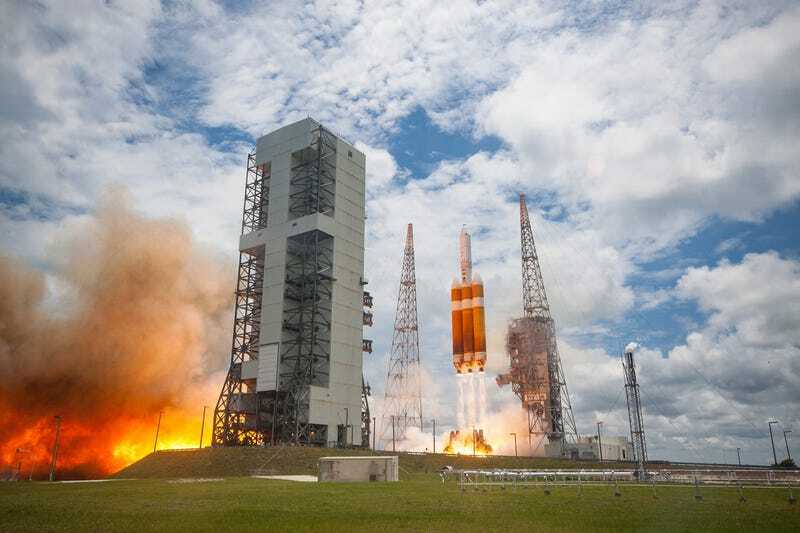 When it finally launches, perhaps as early as this year, it will be twice as powerful as the Delta IV.